Most incidents of violent crime occur between people who know each other, but in other cases (fortunately much less frequent) there are no obvious ties between the victim and the criminal, and these cases cause a great deal of social fear and uncertainty. They also result in large-scale, costly investigations and, increasingly, police are collaborating with other professionals in a process of offender profiling which might help their investigation. This book is a substantial, unique and critical account of the scope and practice of offender profiling, and its limitations. Professionals worldwide, from psychiatry, psychology, criminology and policing, have contributed accounts of their experience and knowledge across a range of approaches to offender profiling. Some use a clinical approach, based on the application of established theories of personality and psychopathy. Others argue for the effectiveness of the objective analysis of offence records to predict future offending. Some of the police contributions provide a frank description of their methods, others address the difficult issues relating to the use of offender profiling. This is a controversial subject, full of potent myth, and the object of this book is to provide a cool overview of the related scientific knowledge, now spread over many journals and reports, as well as accounts of the process and difficulties of offender profiling. It will be useful and interesting to most scientists and professionals in the field of criminal justice. This book is in the Wiley Series in the Psychology of Crime, Policing and Law. 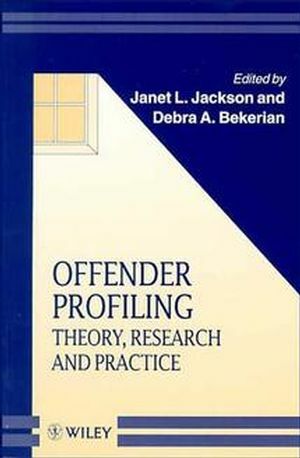 Janet L. Jackson and Debra A. Bekerian are the authors of Offender Profiling: Theory, Research and Practice , published by Wiley. Developmental and Clinical Issues in Relation to Offending in theIndividual (R. Badcock). The Contribution of Personality Theories to Psychological Profiling(J. Boon). The Role of the Expert in Criminal Investigation (G. Gudjonsson G.Copson). Standard Investigatory Tools and Offender Profiling (J.Stevens). A Research Approach to Offender Profiling (J. Jackson, etal.). Predicting Offender Profiles from Victim and Witness Descriptions(D. Farrington S. Lambert). Towards a Practical Application of Offender Profiling: The RNC'sCriminal Suspect Prioritization System (J. House). Specific Profile Analysis: A Data-Based Approach to OffenderProfiling (A. Davies). Critical Issues in Offender Profiling (D. Bekerian J.Jackson).